Tickle My Senses: Do you need help planning your Easter Menu?? PLANNING YOUR EASTER MENU ? Whether or not you've given up your favorite foods and treats for Lent, Easter is a brilliant excuse for indulgence and entertaining. If you do love tasty and wholesome homecooked meals or enjoy having friends over, surely when everyone is relaxing and enjoying their weekend you wouldn't want to miss out on family time together by spending hours in the kitchen. So to make your Easter time memorable and enjoyable, I have specially handpicked for you and seperated into different categories 'quick, simple and delicious' recipes that will keep your family happy and content, and most importantly see you through this period without breaking a sweat in the kitchen! Most ingredients in my recipes are readily available and any spice paste or marinade used are 'Grind free' and can be made with basic store cupboard ingredients. Prior planning does make all the difference. So do get your to do lists ready, set out shopping and get ahead of the game. 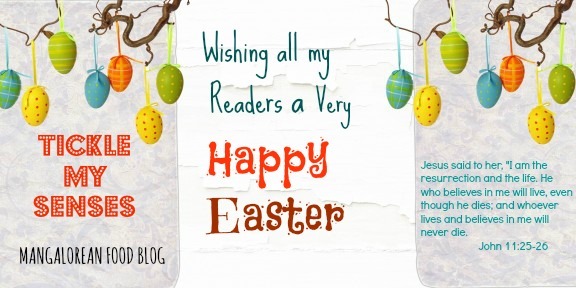 I wish you a very Blessed and Enjoyable Easter. If you do make any of my recipes, I would love to hear from you and receive pictures of your dishes. Please send them either via the message tab on my Facebook page or via email at carol@ticklemysenses.com. I shall feature you and them on the " I CAN COOK series" on my Facebook Page !! Happy Easter and Happy Cooking dear friends!